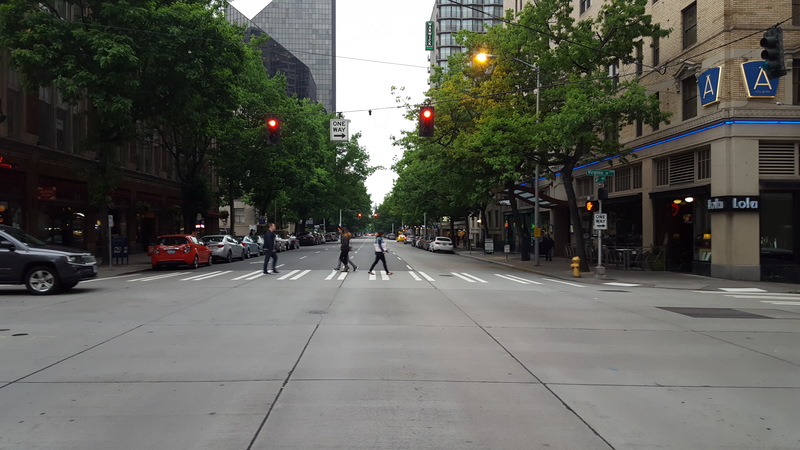 The City of Seattle has cut back significantly on its plans for street safety projects citywide, but especially in Downtown and the southern neighborhoods. This has left advocates confused and frustrated, as the City had extensive plans for protected bike lanes and greenways that would create a comprehensive network. And voters just overwhelmingly approved a $930 million levy to build these projects. While that is sorted out and the City adds on another layer of Seattle Process with a “Center City Mobility Plan”, there is one key opportunity that we could implement today at low cost: redesigning 4th Avenue through Downtown. 4th Avenue is a northbound one-way street and is among the widest streets in Downtown. Not surprisingly, it carries the highest amount of vehicle traffic in Downtown—but not so high that bikes lanes are infeasible. 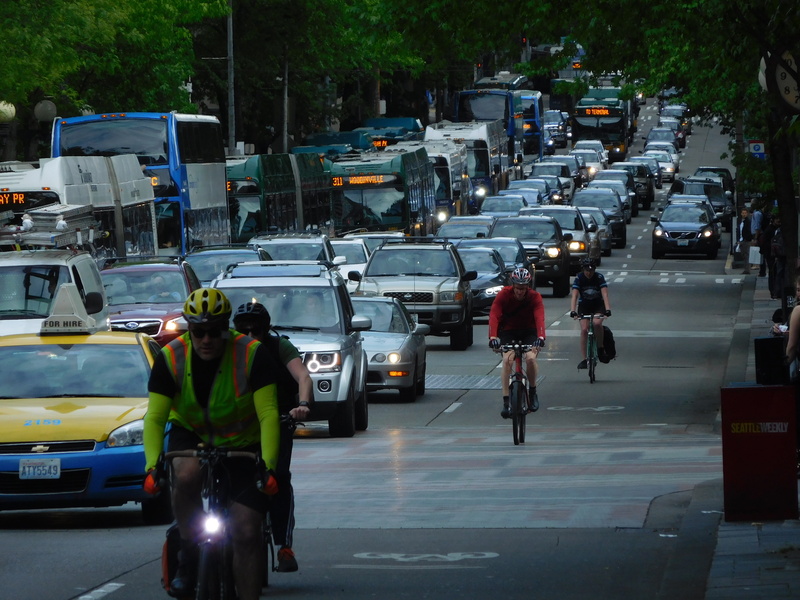 According to the latest counts from the Seattle Department of Transportation (SDOT), between Yesler Way and Stewart Street average annual weekday traffic (AWDT) is 20,600 vehicles. North of Stewart Street to Denny Way, in the Belltown neighborhood, AWDT lowers to 14,100. These numbers along with the street’s use as a regional transit corridor and existing use by bicyclists, make the street ripe for a reconfiguration. The existing design struggles to balance many needs. Like most of the Downtown streets, 4th Avenue is home to many ground level retail spaces, hotel lobbies, restaurants, and parking garage entries that draw private motorists and taxis but which also demand ample sidewalk space. The street also fronts major civic spaces like City Hall, the Central Library, and Westlake Park. On-street parking is located throughout. At the same time, 4th Avenue is a major bus corridor for regional Sound Transit and Community Transit routes and has a peak-hour bus lane. These buses tend to exit 4th Avenue at Olive Way, which leads to on-ramps for Interstate 5. And because the street is relatively flat through Downtown, it’s also a popular route for people riding bicycles. From the roadway width and knowing how many lanes currently exist, we can estimate how much space is allocated to each lane. The graphics below, generated with streetmix.net, generalize the existing conditions in Downtown and Belltown. The upper image ignores an existing unprotected bike lane that only runs between S Washington Street and Spring Street next to the curb, pictured below. The vehicle lanes are already below the standard of 12 feet, a good start that helps keep traffic speeds down. But there are more lanes than needed; as demonstrated by Seattle’s road diet criteria, traffic volumes less than 25,000 only require two drive lanes. In the Downtown portion, there are three drive lanes during most of the day and four to five drive lanes, including a bus lane, during peak hours. On the wider portion of 4th Avenue in Belltown there are no restrictions on the two parking lanes, resulting in four drive lanes all day long even though traffic volumes are lower there. An excellent example of 4th Avenue’s excessive capacity has been illustrated when the left lane between Pine Street and Olive Way is closed for the Macy’s store renovations. Despite the reduction in capacity during the afternoon rush hour, through-traffic continues to move at a steady pace. See below for a video of this in action. In addition, the left lane of 4th Avenue is hardly used by through-traffic during the afternoon peak anyway. This may be because most drivers are headed north or to Interstate 5, which ultimately requires a right turn. Bicyclists take advantage of this situation and have de facto taken over the left lane, illustrated in the (admittedly anecdotal) photo below. The recent redesign of 2nd Avenue, the southbound counterpart to 4th Avenue, provides another case study. 2nd Avenue replaced a painted bike lane and one drive lane with a two-way protected bike lane in 2014, and now during peak periods a standard block has two drive lanes, a bus lane, and an alternating left-turn lane and parking lane. Bicycling traffic has tripled since the implementation and vehicle traffic flows smoothly. 2nd Avenue carries 75-85 percent of the traffic that 4th Avenue does, so a similar approach should work. The proposal in Downtown is to reallocate space on a 1.5-mile stretch of 4th Avenue for a two-way protected bicycle lane, a permanent bus-only lane, and one lane of permanent on-street parking. This leaves two drive lanes for general traffic; this should be plenty of capacity most of the time on weekdays and weekends. Afternoon peak periods may experience a slight increase in travel time, but this is a worthwhile trade off considering the benefits to bicyclist safety and transit speeds. In Belltown, where buses don’t run on 4th Avenue, two lanes of permanent on-street parking can remain. The awkward curb-to-curb width doesn’t permit only one drive lane to be removed, though, so two are removed and two remain. 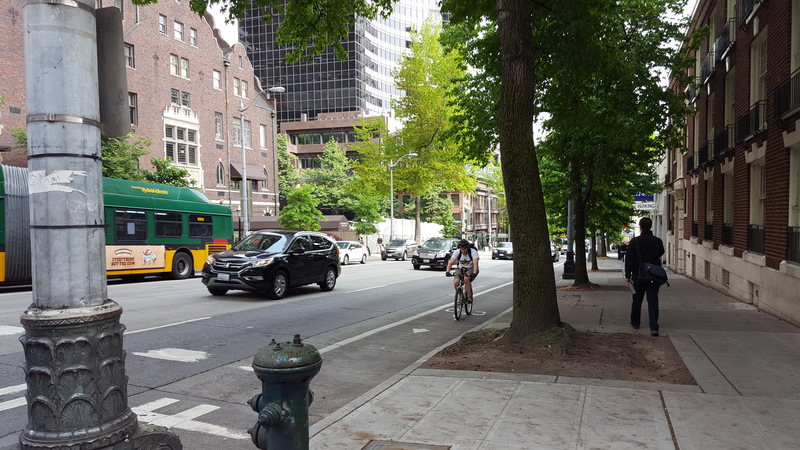 The extra six to eight feet of space could be used to widen the bike lanes, widen the buffer, or do something more creative like constructing a row of parklets or adding landscaping, similar to an idea floated by SDOT for 5th Avenue. Side note: If 4th Avenue is redesigned as proposed there isn’t much reason to implement a PBL on 5th Avenue because it’s only one block away. But the spacing between 2nd Avenue, 4th Avenue, and the future bike facility on the waterfront suggests the opportunity to create an easy-to-understand bike network with safe facilities on every other block; 6th Avenue and 8th Avenues are also relatively wide streets that could easily fit two-way PBLs through Downtown and Belltown. 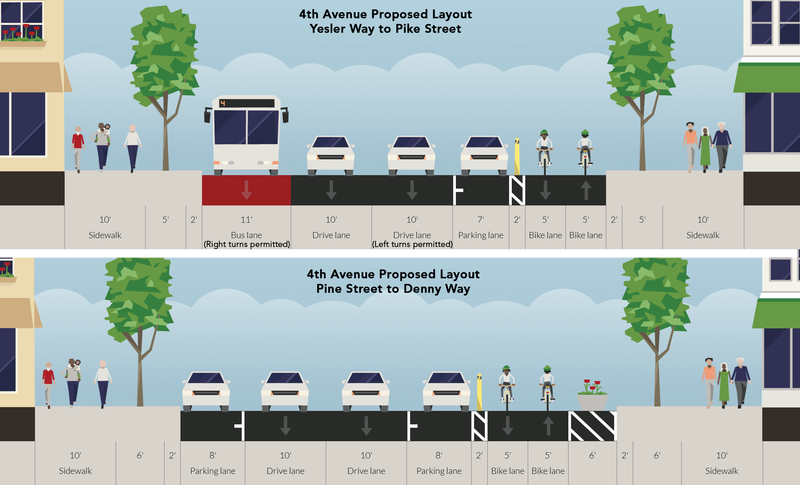 The two-way PBL is a critical component of the proposals, as it legitimizes the heavy bicycle use of 4th Avenue and will encourage more people to bike by creating a safe route through the center of Downtown. I’d wager it would get even more use than the 2nd Avenue PBL because it is more central and it is higher up on the Downtown slope. One look at SDOT’s official parking map also shows how these changes would benefit businesses and other drivers by simplifying the parking situation. Instead of a weave of on-street parking spaces that are prohibited during peak hours, these layouts would create permanent parking lanes and loading zones that can be used all day. This makes the rules easier to understand and could reduce the clutter from parking signs. In addition, the permanent parking lanes and the PBL significantly narrow the main roadway, benefiting pedestrians with shorter crossings at intersections. There is also new space for landscaping, bollards, or concrete curb extensions that could further reinforce intersection corners and help give people walking and driving better views of each other. Of course, it’s not enough to stop here. The 4th Avenue bike lanes need to connect to the rest of a robust network. In the north, the Bicycle Master Plan indicates a protected bike lane on 5th Avenue and the east side of Seattle Center. This looks like a good connection point, as it would cross the paths of a planned greenway on Thomas Street and the existing bike facilities on Mercer Street and Roy Street. In the south is a more interesting issue. Seattle Bike Blog has noted that the Yesler Bridge project will widen the existing unprotected bike lane below the bridge, but planners didn’t go further and make accommodations for a future two-way facility. However, the west sidewalk under the bridge is quite wide could have some space reallocated for the southbound bike lane. Moving further south, the Bike Master Plan shows a continuation of the 4th Avenue bike route intersecting with an extension of the 2nd Avenue PBL and new PBLs on 6th Avenue and Dearborn Street. It would continue on to Airport Way S, which form a backbone through Sodo and Georgetown. To complement this 4th Avenue makeover Olive Way also needs a small fix for buses. There’s a bus lane on most of Olive Way towards I-5, but there is a one block gap between 4th Avenue and 5th Avenue. This gap needs to be filled with a permanent extension of the bus-only lane to give buses greater priority through those intersections. In addition, to make a more complete safe bicycling network Downtown also needs at least one major east-west protected bike lane. The best opportunity for that is either on Pike Street or Pine Street, which reach across I-5 to Capitol Hill on relatively shallow slopes and are fairly central to Downtown. Both streets are transit routes and have on-street parking, so a creative solution will be explored in a future post. Another option would be a two-way PBL on Olive Way, but that street has a three-lane pinch point on the I-5 overpass and would likely impact traffic movements that are under the jurisdiction of the bureaucratic Washington State Department of Transportation. People bicycling and walking are getting hurt and killed on our Center City streets nearly every single day. With the City’s supposed commitment to Vision Zero, soon to be in the spotlight with the NACTO conference in September, it’s time for Mayor Murray and the Seattle Department of Transportation to make bold decisions and complement critical links in the safe bicycling network. 4th Avenue is major street in the core of Downtown and Belltown that can become more accessible, safe, and efficient for everyone that uses it, but only if our leaders step up to the challenge. was the 930 million just for bikes??? I don’t think so. I don’t ride 4th because I don’t want lung cancer. The fumes are terrible – you can taste them. Unfortunately for the “even-numbered avenues have two-way bike paths” idea, 5th and 7th really make sense as bike routes continuing to the north, while 4th, 6th and 8th don’t. 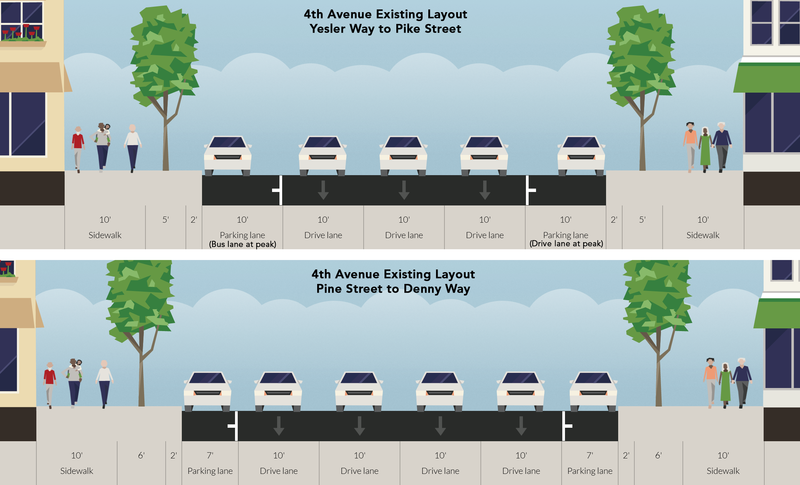 A 5th Ave route could naturally connect to either an extension of the cycletrack on 5th Ave N or a lower-traffic shared street on Taylor, and 5th avoids the streetcar tracks; 7th Ave already connects through to Dexter and is already a two-way route across the tracks. Meanwhile 6th Ave N is destined to be a giant Aurora on-ramp and 8th just ends at Denny. 4th hits Denny at a fairly awkward spot, too, continuing only a block before running into Broad, not lined up with one of the convenient bikey ways through Seattle Center. If we’re going to do two-way bike paths that don’t align with the vehicular one-ways (a big if) the ones to do are 2nd, 5th, 7th, Bell, and maybe Pine. Dexter, BTW, doesn’t cease to be an important bike route after the Westlake Cycletrack opens. Aside from the contingent of Cat-6 racers that will avoid the Westlake crowds, savvy commuters will realize the paths once they enter SLU Park are terrible and not getting better, and signal cycles at Aloha and Valley are terrible and not getting better. On the way south they’ll jump off the Cycletrack at Highland, turn left onto Westlake at the much more favorable signal there, then immediately turn down 8th Ave N, to Roy, then left onto Dexter (by a two-stage turn if traffic in the general-purpose lanes is backed up). Doing the same heading north practically requires a half-block of riding along the west sidewalk of Westlake between 8th Ave N and Highland; most of that stretch is wide but not all of it. If the city doesn’t want people doing that it had better do 9th Ave N really well, really quickly! A few years ago (before the 2nd Ave Cycletrack) I used to ride all the way through downtown on 4th every now and then. I think I usually got there just after peak-hour parking restrictions ended, which was the worst: still heavy traffic, but all kinds of different things going on curbside (parking, turn lanes, occasional through lanes, pick-ups, and valets). The first crazy part was the constantly changing situation in the left curb lane, forcing me to make a few lane changes in heavy traffic. The second crazy part was Belltown: less traffic in more lanes meant higher speeds, so by the time I had gaps in traffic to change lanes (to prepare to turn right) that traffic was moving way faster than I could manage. So I see any proposal to reduce the number of through lanes in Belltown and smile inside. Replacing through-lanes in Belltown with parking spaces for jacked-up Hummers would be better than what’s there today. I like this idea, and hope we implement it in the long run. However, I think we would do far better to focus on connecting the protected bike lanes on 2nd to more of the city than to build a parallel route two blocks away. With fewer miles of protected bike lanes, say on 9th and Bell you could connect to the new Westlake Bikeway, and have a safe and flat route to Downtown from Westlake, Fremont, and basically anywhere on the Burke. That would be vastly more valuable than a route two blocks over. Similarly, connecting 2nd to the Rainier Valley via King or Dearborn would open up a whole quadrant of the city to Downtown by bike (though obviously we need to build more bike routes in the RV). I absolutely welcome bike lanes on 4th – but I’d be much, much more excited to see connecting routes completed before we fill out parallel routes. 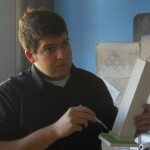 Nice write-up, Scott! I especially like the use of a construction closure to exhibit how well traffic flows with a reduced number of lanes. I wish the city would start doing that when presenting to the public during safety project open houses. I really wish we used construction closures as the perfect opportunity to introduce new bike lanes. Parking is often eliminated “temporarily” during long-term construction of a year or two. People find other places to park during that time, and they become used to the area without parking on the street. Rather than re-stripe parking when the projects are complete, we should be painting new bike lanes (especially protected bike lanes) when those long term projects are finally complete. I ride past multiple construction sites on 2nd and 4th Avenues every morning (forcing me to merge with traffic) that would make great PBLs when they’re done.